Dilazak (or Dalazak) Afghans of Karlanri division are said to have occupied Peshawar valley in 11th century. Dilazaks have tradition that when they first into Peshawar valley, they found red-complexioned Kafirs there. 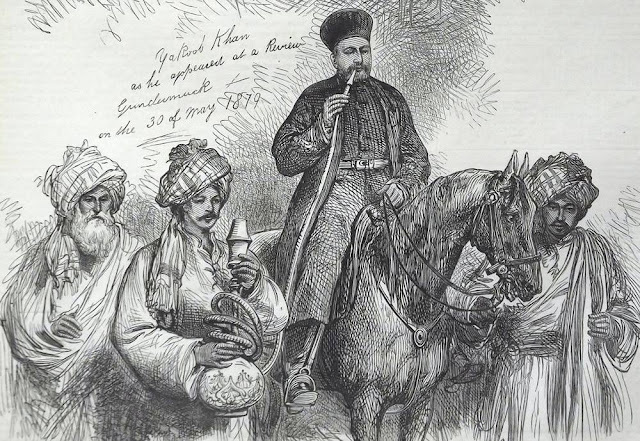 It is said that when Sultan Mahmud of Ghazni led his famous expedition against Somnath, he was joined by a large contingent of the Dilazak under the leadership of Yahya Khan. Dilazaks entered into alliance with the Shalmanis who held the Hashtnagar tract in the Peshawar valley. They paid tribute to the local governor of Ghazni while the the Shalmanis were the subjects of the Sultans of Swat. In 15th century, when Yusufzais reached Peshawar, broken, fatigued and powerless after the massacre at the hands of Mirza Ulug Beg ---- they applied to their brother Afghans and Musalmans, the Dilazaks, for help, and a place wherein to take up their residence. With a generosity unknown to the later tribal story, the Dilazaks assigned to them the Doaba, that fertile tract in the triangle between foothills and the junction formed by the Kabul and Swat rivers ---- where Shabqadr now stands. Malik Ahmad, the chief of Yusufzais and Mandanrs, on the part of his people expressed his gratitude , but characteristically pointed out that the Doaba was but a small district and numbers of his people remained behind, intending to rejoin their kinsfolk as soon as they should find a home. Was there no other land? The Doaba is among the most favoured tracts in Pakhtunkhwa, so the Yusufzais were bidding high. But the Dilazaks, it seems, were still of generous mind. They told Malik Ahmad that, if the Doaba was not large enough , there were the valleys of Danish Kol and Ambahar as far as Bajaur, which they might occupy. And even more -----there was still Ashnaghar (Hashtnagar) which they could win by the sword from the Dehgans, subjects of the Jehangiri Swat Sultans. The Yusufzais and Mandanrs ----then took up the Doaba as offered , and soon after were joined by their families and flocks. They soon advanced into Bajaur, and went on still further and approached the Panjkora river. At the same time the took over Hastnagar from Dehgans and began to encroach on Dilazak lands in the main Samah . Some years later, Malik Ahmad assigned Doaba to Gigyanis and Hashntnagar to Muhammadzais. Soon conflict escalated between Dilazaks and Khashis (Yusufzais , Gigyanis etc), and although native historians lay the blame of the quarrel upon the cattle-lifting propensities of the Dilazaks, the contrary is the most likely supposition. The Yusufzais were the first to break faith, but they were soon joined by the Gigianis, Mohammedzais and Uthman Khels ; a great battle was fought on the North side of the Swat river, in which ---- the Dilazaks were routed with great slaughter, and fled precipitately to Hazara.. The Dilazaks were excellent archers, the Yusufzai notorious swordsmen, and, observing the havoc caused by the, flights of arrows at a distance before the Yusufzai could close, Malik Ahmed sewed several hides together, under the shelter of which large bodies advanced uninjured, and speedily put the enemy to flight after great slaughter. At this battle of Katlang , Khan Kaju whose father was the chief of Mandanrs, was in his early manhood, was also present with his tribe, and with a body of them perused the retreating Dilazaks as far as Abaseen. He had sought in marriage the daughter of the chiefs of Dilazaks, but the latter declined to accede to the alliance. The chief and his family were on the river's bank, endeavoring to get across, when the Mandanrs came upon them. Seeing Khan Kaju, he implored him to keep back his men, that the females might be sent across, otherwise they would all throw themselves into it and perish rather than be made captives. His appeal to the youth was not without effect. ; and taking pity on the Dilazak chief, he cried out to his clansmen : "Give over, Kinsmen, let them alone ! Do not harm them , for , after all, they are Afghans like ourselves." The chief was thus enabled to get across safely with his family. Not long after the Dilazak damsel became the bride of Khan Kaju . The plain of Peshawar, South of the Kabul river, still continued in possession of the Dilazaks. In 1519's military campaign of Babur, the Dilazak Chiefs, burning to avenge themselves on the Yusufzai, attended him as allies and guides. Baber’s invasions of India in 1526 did not affect the tribes about Peshawar, but they took the opportunity of his continued absence to withhold their tribute, and to revert to their plundering habits, The Dilazaks, too, finding the fort at Peshawar inconvenient to them, destroyed it shortly before Babur’s death, which occurred at Agra in 1530. In 1553 Hamayun, prepared to invade India, and as a preliminary measure rebuilt the fort at Peshawar which the Dilazaks had destroyed. A strong garrison was placed in it under the command of Sekander Khan, Uzbek : and the fort was provisioned with the grain of the neighboring Dilazaks. The latter soon afterwards attacked it, but were repelled by the Uzbek commander. In the following year Humayun recrossed the Indus on his road to Delhi. After his departure, the Ghoria Khel Afghans, consisting of the Khalil, Mohmund and Daudzai tribes, entered the plain of Peshawar, and, ousting the Dilazaks, took possession of the districts in which they are now located, and to which they gave their names. The Dilazaks were driven across the Indus. Mughal Emperor Jehangir caused the Dilazak Afghans to be removed from the two hazarahs, together with the Kathars, a non-Afghan tribe. He set out for the Punjab in 1015H , and in the first month of the following year 1607-8 AD, when about to proceed to Kabul, he made Zafar Khan , son of the late Zain Khan Kokaltash, governor of Attock and its districts, and gave him directions to have the Dilzaks and Kathars , on account of their depredations, removed near to Lahore , and to have their removal affected before his return from Kabul. The command was carried out ; and some 100,000 families are said to have been removed on this occasion. Early in the 18th Century, on the expulsion of the Karlugh Turks by Syed Jalal Baba, Jadoons crossed the Indus and appropriated the country about Dhamtour, and about hundred years later they took the Bagra tract from the remaining few Dilazaks who held it. A Purdil Khan Dilazak, called by the nickname of Chibi-Tani, because he had always forty trusty followers at his back , was governor of the province of Sarain the Deccan ,and there were other Dilazaks besides . Dilazaks were noted for their superior archery skills, large number of them enlisted themselves in the Imperial Mughal army. A Mughal officer Mirza Nathan had a contingent of Dilazak Afghans who are described in his book, Baharistan-i-ghaibi, as very good archers . There were 3,000 Dilazak cavalrymen in Khan Jahan Lodi’s army which was sent against the Kingdom of Bijapur in 1615 AD. 6- H.G.Raverty, "Notes on Afghanistan"